Finding scale insects on your sago palms (Cycas revoluta) is no laughing matter. 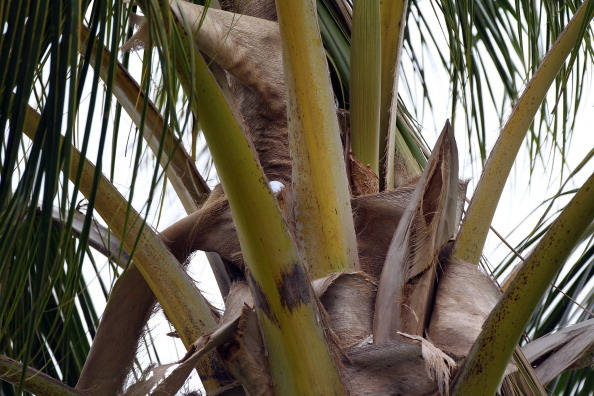 The false oleander scale and the Asian cycad scale both feed on sagos' sap. False oleander scales occur wherever sagos grow in U.S. Department of Agriculture plant hardiness zones 9 through 11. The cycad scales have a limited range outside their native southeastern Asian habitat. Treating the first is seldom necessary, but treating the second is essential. 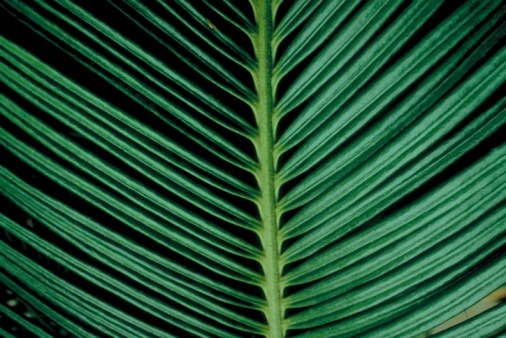 A close-up of a sago palm plant. Both pests construct predator-proof armor from their shed skins and sticky wax secretions. Asian cycad females have flat, rounded armor. False oleander scales are more elongated. The former infest the crowns and older leaves and then move to the fronds' surfaces and midribs. Their colonies eventually cover entire plants, including the cones, seeds and roots. The latter remain on the backs of the fronds. To identify which scale to treat, observe your sagos' symptoms. Both insects cause yellow spotting on the fronds' upper surfaces. Fronds with false oleander scales become completely yellow and drop prematurely. Those hosting cycad scales turn brown and wither. False oleander scales seldom harm the plants, but cycad scales reproduce at an astonishing rate and may kill small sagos within weeks. Prune fronds with large numbers of false oleander scales. Rinse your pruning tools in rubbing alcohol between cuts and after use so they don't spread scale nymphs, and dispose of the fronds in sealed plastic bags. Pruning may also treat early cycad scale infestations. Another possibility is to hose the scales off with a strong stream of water. For this to work on cycad scales, monitor their numbers constantly and drench both surfaces of each frond, along with the trunks and the cones. Chewed scale armor that houses no insects is the work of the singular black lady beetle (Lindorus lophanthae), a primary false oleander scale predator. To attract more of them, plant light-colored, pollen-producing flowers such as perennial golden marguerite (Anthemis tinctoria), suitable for U.S. Department of Agriculture plant hardiness zones 3 through 7, or annual "White Sensation" cosmos (Cosmos bipinnatus "White Sensation"). 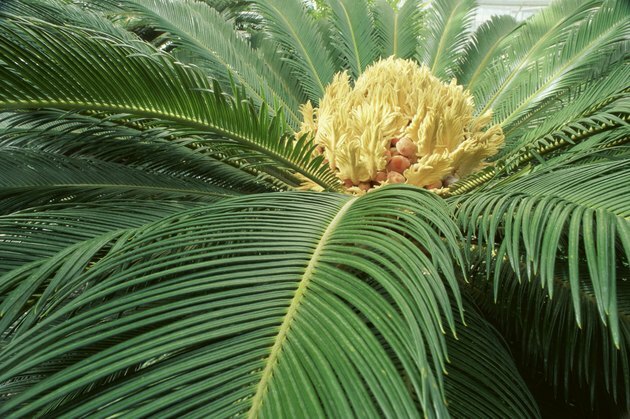 The USDA is currently researching biological predators for Asian cycad scales. Pruning and predators normally keep false oleander scales in check. If you need an insecticide to treat cycad scale, the University of Florida IFAS Extension recommends horticultural oil. Spray biweekly when temperatures average 70 degrees Fahrenheit or higher and monthly in cooler weather. Among the available insecticides, the oil poses least risk to bees and other beneficial insects. On a calm, clear early morning with no rain in the forecast, water your sagos and spray while the temperature is below 90 degrees Fahrenheit. Dress in a long-sleeved shirt, long pants, socks, shoes and a hat. Wear chemical-proof gloves, protective eyewear and a respiratory mask. In a pressurized tank sprayer, mix 1 1/2 to 2 1/2 tablespoons, or the product's specified amount, of oil concentrate per 1 gallon of water. Lift each frond individually and spray both the top and bottom surfaces until they drip. Spray the base of the crown, trunk and cones, getting into all the crevices. Also spray the soil around the sagos every other month to kill nymphs migrating to the roots. After spraying, discard the leftover solution where it won't flow into drainage systems or surface water.